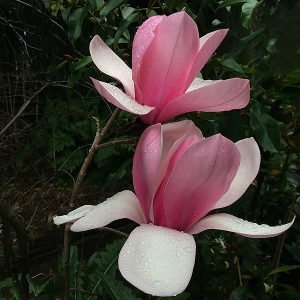 We do love the deciduous Magnolias, and those such as Magnolia ‘Sweetheart’, with flowers that have reverse colours on the petals can be particularly appealing. The beautiful contrasting mid pink and pale pink flowers of Magnolia ‘Sweetheart’ make this a standout deciduous Magnolia. Flowering in early spring, the flowers are deep pink on the outside with a paler pink on the inside. Individual flowers appear on bare stems and are help nicely upright. The flowers are mildly fragrant, foliage is a good glossy green and the plant itself has a fairly upright habit. Over time Magnolia ‘Sweetheart’ will get to around 5 metres in height with a spread of around 4 metres. It makes an excellent small feature tree for a medium to large sized garden. This is an excellent specimen tree for parks, gardens and commercial plantings. Spread – Will spread to around 4 metres. Position – Full sun to part shade, a position protected from strong winds is best. Soil – Best in a humus rich well drained. Water logged or heavy clay soils are not suitable. Frost tolerant – Regarded as moderate once established.